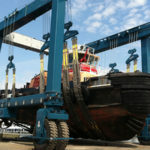 50 ton travel lift can make it easier and safer to lift and transport vessels. 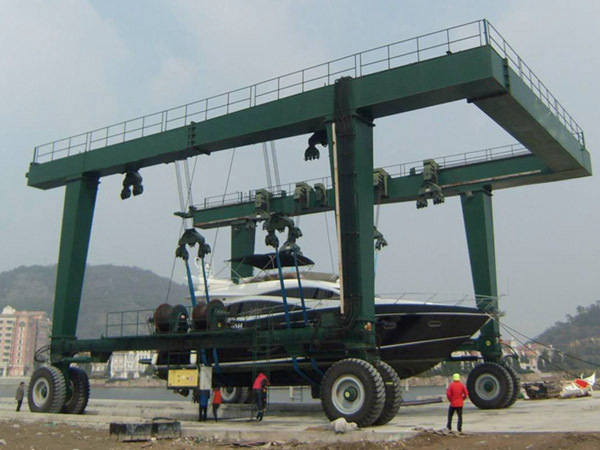 As a heavy duty lifting crane, 50t marine travel lift has enough power to lift boat easily. The reasonable “U” shape design ensures the device can lift the ship with large size. A number of wheels make the lifting flexible and efficient. The electric power or hydraulic power supply energy for the crane traveling. 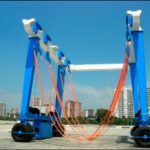 With comprehensive safety protection devices, this particular rubber tyred gantry crane has high safety. And it can protect the operator from accident, reduce the risk rate, improve working condition and save labor resource. 50 ton travel lift is also an amphibious travel lift. It can be used in the water and on the ground. 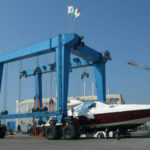 The crane can put the boat into and out of the water, it can lift and transport the boat or other goods on the ground. 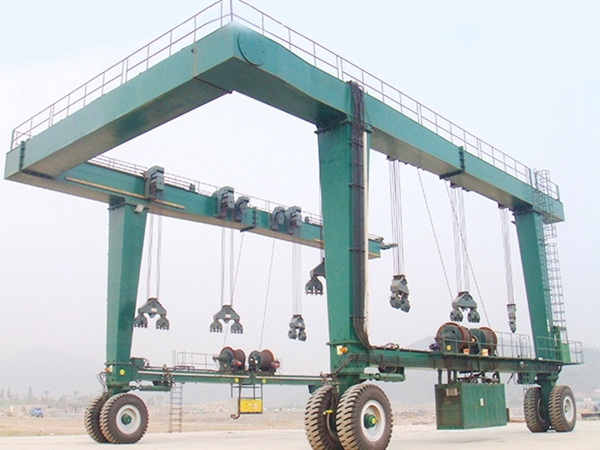 This special gantry crane has ability of climbing smooth slope. Our company provides reliable 50 ton travel lift. With compact U shape design, powerful energy, durable slings, flexible rubber tires, large loading capacities, it has wide application in many occasions, such as dock, shipyard, factory. This mobile boat hoist crane can increase working efficiency, reduce accident rate, improve safety level and ensure stable performance. 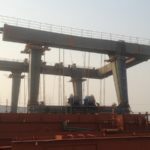 50 tonnes boat lift crane has reasonable design. 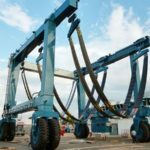 The crane has particular U shape frame, this makes the crane can lift boat with large size. Because the room is enough. The sling adopts durable and soft material. 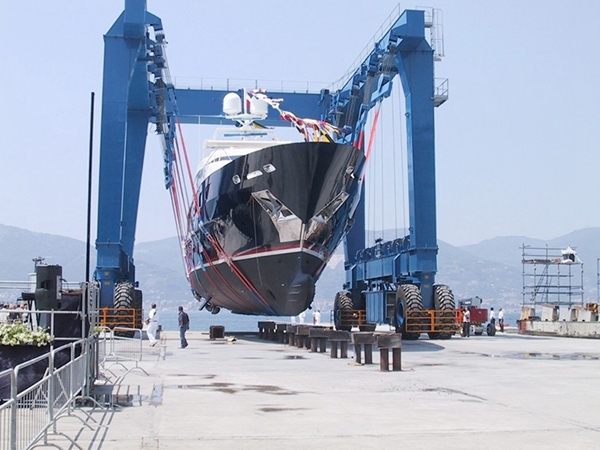 Although yacht travel lift is used for lifting heavy boats, it never hurts the boat damage. The sling number can be customized according to practical condition. The sling lifting points can work together at the same time. In this way, the whole travel lift can lift and transport the vessel stably and smoothly. And it can also reduce the stress from the boat evenly. The rubber tires are anti-skid tires. They can move at different speeds based on operator needs. The tyres have powerful tolerance. A number of tires can bear the pressure from the boat evenly. This makes the vessel lifting safe and efficient. With compact structure and simple system, the crane takes little time to maintain and check. To ensure safety, the operator should take a overhaul check for the travel lift before and after using the crane. If the structure is very complex, it is a difficult job. Compact system can save much labor resource and energy. For any abnormal condition, simple structure makes the operator easier and quicker to find the problems. Extra lifting eyes for shortening sling to lift smaller craft. A.This reusable pin is necessary for quick disconnect operation. B.Pin is galvanized for corrosion resistance. C.GAC wire with retaining clip holds pin in place. A.Saves time needed to lower the lift for removing slings from the hooks. B.Available for sling ply, 6 inch or wider only. C.Protective flap to cover pin standard. A.Helps protect the sling from abrasion and cutting. B.Sliding sleeve style allows sling to adjust to center point without scraping along keel. C.May be sewn to center of sling. D.Pad uses the same webbing as the sling. A.Helps to protect boat chines and rub rails and the sling from abrasion damage. B.Sliding pad can be positioned to accommodate any size and style of boat. C.May be sewn to sling per your specification. This treatment can be applied to slings to help prolong sling life. A.Promotes sling life by protecting eyes of sling. B.Easter attachment of sling to lifting hook. C.Galvanized steel for corrosion resistance. 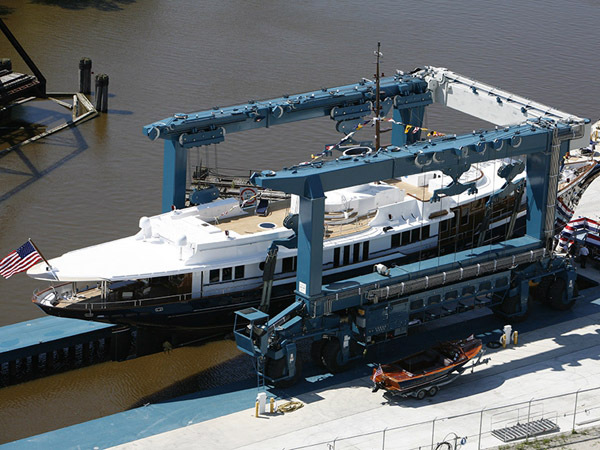 99% of the marinas in the world adopt mobile boat hoist crane for boat lifting and transporting. 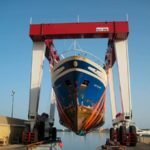 To service the crane lifting and transporting, marine travel lift becomes the first choice. 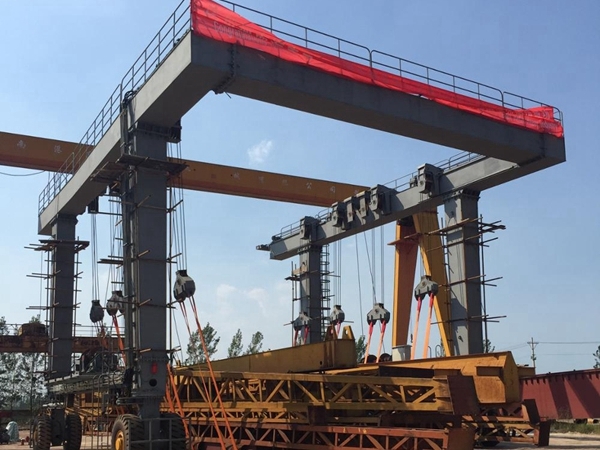 Because travel lift gantry crane has competitive advantages. 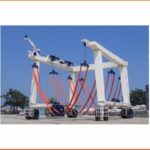 First, hoist travel lift crane can bear the load that exceeds 120% of rated load. That is to say, the travel lift is safe under the condition that lifting tons is within the range of rated load. The boat heavier than the rated load is forbidden to lift. If the device has wrong estimation of travel lift tons, the safety protection device will alarm and travel lift can’t lift the boat. This can avoid overload condition and reduce accident rates. Second, the lifting points are independent and controllable. 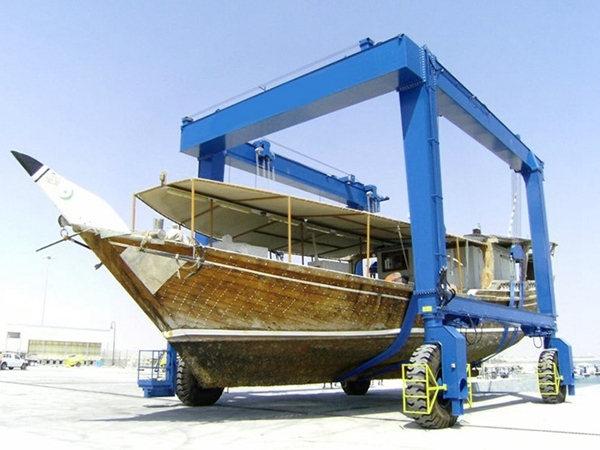 The crane can lift the boat based on lifting points and realize precise operation. The crane design meets the requirement of boat shape design. The lifting points are marked on the boat body. This makes the operation convenient and easy. Every lifting point can be adjusted independently to control the distance of straps and boat levelness. Third, the lifting way is similar to hold the boat with the straps. There is no extrusion for the boat body. The straps are soft and firm, and can protect the boat from surface damage. Except for above advantages, straddle travel lift has other features as following: it has small size and takes little area, the structure is convenient to disassemble, install and travel. According to application places, travel lift can be divided into two types, marine travel lift and construction travel lift. Customers can choose suitable one based on practical needs.